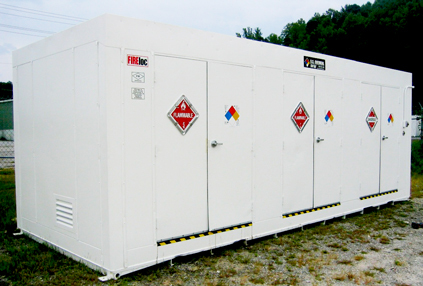 Proper flammables storage can bring enhanced safety to your workplace, as well as increased productivity and compliance. At U.S. Chemical Storage, it is our goal to help you achieve all of the above, granting you total safety while helping you save money in the long run. Our flammables storage solutions are designed to facilitate the flammables storage process, helping you operate safely and efficiently. Flammables storage is not a subject to be taken lightly. Improper flammables storage can result in potentially life-threatening disasters or costly destruction of property. It is important to take every possible measure for safe flammables storage, and U.S. Chemical Storage is here to help. According to OSHA, flammable liquids are liquids having a flash point below 100°F, while combustible liquids have a flash point at or above 100°F. Below, we include tips on mitigating hazards of both chemical classifications. Your flammables storage containers should be designed to prevent outside fires from interacting with the chemicals within. Steps must also be taken to prevent internal fires from occurring. If your materials produce flammable fumes or vapors, mechanical ventilation can prevent dangerous accumulations of fumes and vapors within your flammables storage building. Heed all government regulations to achieve compliance. We have countless options for flammables storage. Our Fire Rated buildings can be customized, built according to your specifications so you can rest assured that you’re getting the safest buildings in the industry. U.S. Chemical Storage is dedicated to helping you achieve compliance while protecting your inventory, personnel, and community. Keep in mind, this material is intended only for guidance in flammables storage. It is not intended as legal advice. Consult federal, state, and local regulations for total compliance.